As soon as a child starts moving, he wants to GO! 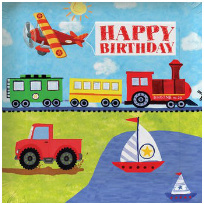 Celebrate your child's fascination with our "On The Go" transportation theme party items featuring a train, airplane, sailboat and truck all in one scene! Create a vehicle theme birthday event with these great party decorations and supplies.